Specialty Dental Surgeons in Corona, California, Azusa, California, Santa Ana, California, Pico Rivera, California, or Ontario, California. 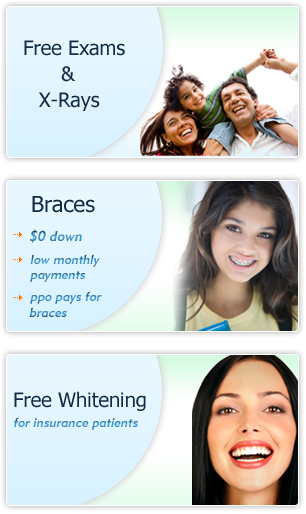 Our Braces Specialists offer a complete and “Free” consultation . From traditional braces to clear brackets to Invisalign, you will be offered different choices at affordable prices based on your needs. Then the best Orthodontic treatment will be chosen to correct teeth that are crowded, crooked, protruding, out of alignment or have irregular spacing. By moving the teeth into the ideal position, dental braces help to create a more attractive and healthier smile for both children and adults. Did you know most PPO insurances have Benefits for Braces? Your City Dental Doctors and team are dedicated to making your child’s dental visit pleasant and comfortable. We understand the importance of establishing good oral habits early in a child’s life and believe that if children can have fun while developing positive dental habits, they will be more likely to have good oral health for the rest of their lives. City Dental Centers is committed to making Your Children’s visits a relaxed, fun and enjoyable experience. Implants, Wisdom Teeth Extractions, Bone Grafts, and all of your Specialty needs are available at Your City Dental Center. You will not be treated like a number, you will be cared for with professionalism, compassion, and respect by our dentists, staff, and Specialists alike.